UGA studies potential partnerships with industry to engage more students in STEM fields. Some of Avalon Kandrac’s most enlightening moments as an undergraduate in the University of Georgia College of Engineering are outside the classroom. Meeting professional engineers and working as an intern helps her better understand the academic lessons, which can be a challenge, and keep her on track. 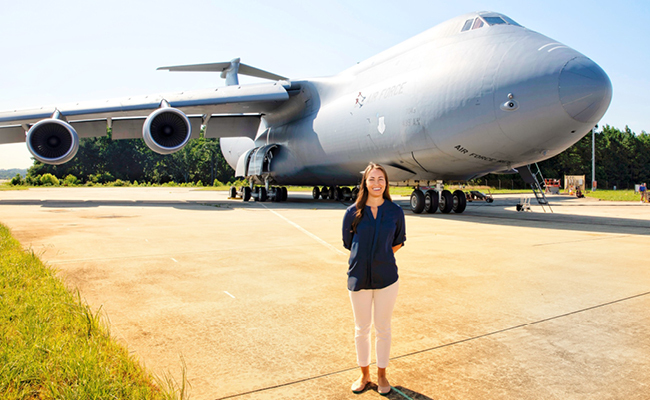 This summer she’s working at Lockheed Martin in Marietta, helping develop safety policies and environmental goals. She expects to graduate next year with a degree in biological engineering with an emphasis on the environment. “Business engagement early on is really helpful,” Kandrac said. David Tanner, an associate director at UGA’s Carl Vinson Institute of Government, is working alongside two other UGA units to find ways to engage businesses with higher education to help keep students in science, technology, engineering and math (STEM) fields and to provide them the experience that the companies are looking for in graduates. The aim is to get kids interested in STEM fields in grade school and keep them engaged through college and into their career. That would be attractive for universities, students and businesses. Using an interdisciplinary seed grant from the UGA president’s office, Tanner and colleagues Timothy Burg, director of the Office of STEM Education, and Karen Webber, an associate professor at the Institute of Higher Education, are developing a tool to help businesses make smart investment choices in higher education. They have convened focus groups over the last year to gather input from educators, administrators and business leaders. Those conversations across and between organizations is critical to figuring out what works and what doesn’t. Tanner has met a lot of business people through Crystal Leach, director of industry collaborations in the UGA Office of Research, and Jill Walton, executive director of UGA Corporate and Foundation Relations. Their connections have helped him gain valuable insight into the needs and observations of industry. His research could help them convince more companies to invest in UGA students. There’s no one-size-fits-all solution in the universe of STEM careers, but each company has unique experiences in recruiting talent to add to the conversation, said Amy Hutchins, education and workforce development manager at Georgia Power. Tanner and his team are helping bring those people together, she said.